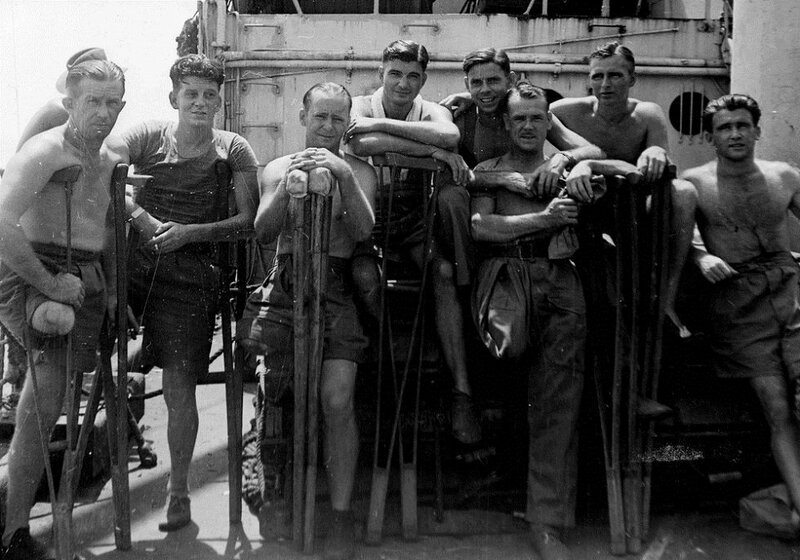 Group of limbless POWs on board H.M.T Highland Chieftain, on arrival in Darwin, Australia, 1945. Image courtesy of Argus Newspaper Collection of Photographs, State Library of Victoria. Kojima Hisajiro was an under-officer in 101 Naval Base Administrative Unit, which was carrying out pioneer at Nancowry and Kamutra Islands in the Andaman and Nicobar Islands, India. Asai Kenichi was a seaman attached to the unit and under command of Kojima Hisajiro. Waris and Abdul Karim were Indonesian civilian labourers brought from Sumatra, Netherlands East Indies (present-day Indonesia). 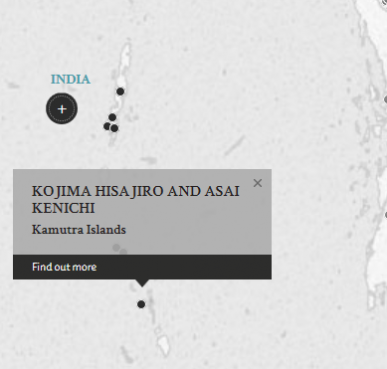 Sometime in May or June 1945, Waris and Abdul Karim stole biscuits from a Japanese store on Kamutra Island. The next morning, Kojima Hisajiro interrogated them and they confessed. Under Kojima Hisajiro's orders and in his presence, Asai Kenichi tied them to a post by their wrists and beat them continually for 3 days without food and water. This resulted in their arms being dislocated, their wrists cut to the bone and bodies bruised. Their friends carried them to Nancowry Island, where they died 2 days later. Both Kojima Hisajiro and Asai Kenichi were tried for both their deaths and found guilty. Kojima Hisajiro was senteced to life imprisonment and Asai Kenichi was sentenced to death by hanging. The petition against the sentence appealed to Christian teachings. Kojima, Hisajiro. Technical Sub-Lieutenant (2nd class). From Japan military. From Japan. Guilty. Life Imprisonment. Sentenced confirmed. Asai Kenichi. 2nd Class Seaman. From Japan military. From Japan. Guilty. Death by hanging. Sentenced confirmed. Jenning, C.R.E. Lieutenant-Colonel. From Australian military. Solicitor. Tokunaga, Shoji. Tokyo High Court. Makino, K. Tokyo High Court. Whyte, D. Captain. From British military.